Feeding Los Cabos Kids - Welcome CABOHOLICS! 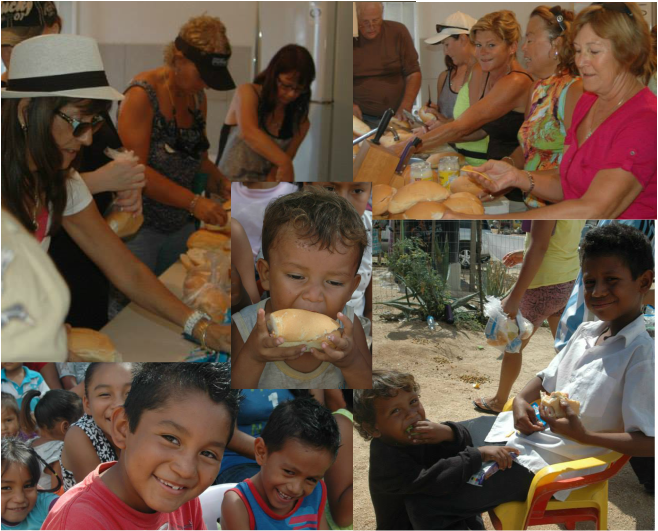 Feeding Los Cabos Kids is one of the programs in place by The Cabo English Church in Cabo San Lucas, BCS. Organized and operated by Tony Hernandez and Lupe Hernandez with the help of their wonderful children and the volunteers who give of their time and donations. This program is ongoing and operates throughout the year, not just a temporary relief effort. The idea is to bring people in the poorer communities together and show them how to care for each other as a community. 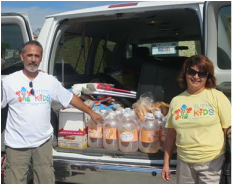 There were 11 community kitchens in operation before Hurricane Odile. All but 3 were completely destroyed. Efforts at this time are to restructure, reorganize, and rebuild the kitchens that were destroyed and repair the others. The temporary relief efforts that took place for almost 2 months after the hurricane are now being focused on the rebuild and reorganization of the communities. Donations and volunteers are needed more than ever to get these communties in operation so as to go on and help build more. Currently, it is only Tony and Lupe who are working on the project. They try very hard to do it all, but help is needed. The facebook page, website, buying of the food, sorting the donations, disbursing the donations, taking calls, answering questions, picking up donations, etc ... is all done by them. If you are interested in volunteering regularly, please contact either of them. And please, be patient as they many not be able to get back to messages right away. On Tuesdays and Thursdays, Sandwiches are taken to the communities. On Wednesdays, they currently do not have the funds budgeting for sandwiches. If you would like to sponsor a lunch and feed about 150 kids and their moms, you can do so. It costs about $100.00 total for sandwiches, snack, and a drink for the whole group. If you would like to do a little shopping the night before or even the morning of, you can bring everything to the office at 9am on Wednesday and the sandwiches will be made there. If you do not have time to shop, you can contact Tony or Lupe and see if someone can do it for you. If you're wanting to drop off donations ... Pat with The Giggling Bean Coffee shop who goes out with them regularly has agreed to take donations at The Giggling Bean Coffee shop, where they will be picked up and taken to the Feeding Los Cabos Kids office. If you want to join in a visit, you can either meet at the Feeding Los Cabos Kids office at 9am on Tuesdays or meet at The Giggling Bean Coffee shop a bit earlier, enjoy a great cup of coffee and even breakfast before walking over with Pat to the Feeding Los Cabos Kids office. You can contact Tony Hernandez or Lupe Hernandez via their Facebook pages. You can also give the Feeding Los Cabos Kids Facebook page a "LIKE". If you are needing to get in contact quickly, give Lupe Hernandez a phone call 624-138-2102. CLICK HERE TO SHARE ON FACEBOOK!!!!! !